The first thing that comes to my mind when reading this book is that it's quite similar to Danny Gregory's Shut Your Monkey: How to Control Your Inner Critic and Get More Done. Both authors Danielle Krysa and Danny Gregory talk about dealing with the inner critic from their own perspective. Because the subject matter and content are quite similar, I would recommend one but not both books. You can pick up either depending on who you like more. Danielle Krysa is a collage artist and creator of the popular blog The Jealous Curator. Her two earlier books are Collage: Contemporary Artists Hunt and Gather, Cut and Paste, Mash Up and Transform and Creative Block: Get Unstuck, Discover New Ideas. Advice & Projects from 50 Successful Artists. 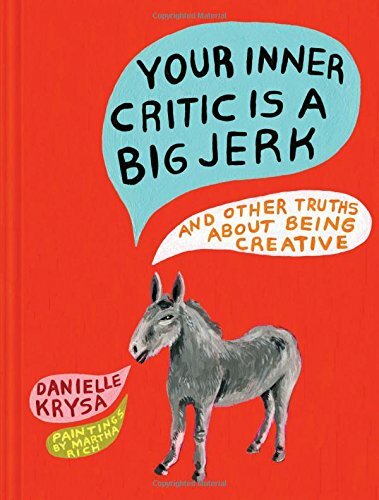 In this new book, she talks about the inner critic and dealing with criticism. Artists receive criticism all the time and some take it better than others. This book talks about how you can handle criticism and what to think of them. There are suggestions on how you can adopt a positive mindset for you and your work, activities to do to break out of procrastination and doubt, and interviews with other artists who have also faced similar situations. In fact, one day ago, I received a comment on my Youtube channel that says "I don't think this person is much of an artist... At least he isn't a good drawer..." LOL. I have my own personal take on how to handle criticism as well, but I don't think I'm gonna write a book anytime soon. Actually, what's written need not be applied to artists. It's not unusual for people to have self doubt or that inner critic once a while. It's how you deal with it that determines who you will become and what you can achieve. If you ever have self doubt, about finding your way as an artist, this can be quite an uplifting and inspiring book.